The Kennedy Half Dollar coin, first minted in 1964, was intended as a memorial to President John F. Kennedy, it was authorized by Congress just over a month after his death, and striking of the new coins began in January 1964. The Kennedy half dollar coins vanished from circulation soon after their release in April 1964 due to collectors, hoarders and those interested in a memento of the late president. Starting with 1965-dated pieces, the percentage of fine silver was reduced from 90% to 40%, but even this change failed to restore the coin to general circulation. In 1971, silver was eliminated entirely from the coins. A special design for the reverse of the half dollar was issued for the United States Bicentennial and was struck in 1975 and 1976. Even though ample supplies of half dollars are now available, their circulation is extremely limited. 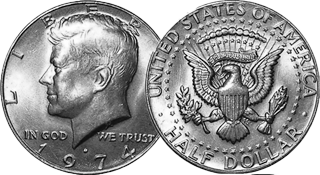 Since 2002, Kennedy half dollar coins have only been struck to satisfy the demand from collectors, and are available through the Mint.